Held on 5 - 7th April in Dusseldorf, Germany. BeGeistert is a biannual meeting of BeOS users and developers held in Germany. It's currently held in a church hall in Dusseldorf-Eller. I've been going since Number 4 and I thought I'd write my impressions of it and my thoughts of the things discussed. I travel from Amsterdam in the Netherlands via the high speed train which takes 2 1/2 hours. While this may sound long it's a short journey compared with the 5+ hour drives some have to do - Germany is a big country. Germany is also using the new Euro currency so for the first time I went to a different country without having to change my money and this consequently saved a lot of hassle. While the main event is Saturday and Sunday if you are staying on site (there are plenty of rooms to sleep in) you can stay Friday as well. I did my usual routine and turned up when most people had already gone out for something to eat. However there were a few people to chat to and good German beer on hand - the local brew "Alt" takes some getting used to but you can drink copious amounts without getting even a hint of a hangover..
BeGeistert has become almost a social gathering as you recognised the same faces each time and as ever I had conversations with various people. On the first night I ended up discussing the merits of free (as in beer) software until 4:30am - the point being that open source is not only non-innovative but may also work against innovation as anything new is immediately copied and thus it's difficult to run a business based on it - an interesting point. The next day I got up late as usual but still managed to get something nearly resembling breakfast. There were more people as would be expected and as usual some were engaged in conversations, others were coding while yet others were engaged in conversations about coding. There were the usual smattering of computers sitting around along with the obligatory network. Interestingly, by far most this time most were laptops, and all but one of the rest had LCD monitors. I guess everyones got fed up lugging heavy PCs around! There was even a new iMac present (the weird looking one) and Peter kindly gave me a lesson in video editing OS X style (the iMac belongs to his wife Nadja who was also there), just plug in the camera, grab the footage and start editing, very easy. I want a Mac. One conversation that came up was the cost of Macs, they are generally considered overly expensive but is this really true? Firstly they are compared to bargain basement PCs when they should really be compared to Compaqs (or the like) where the price difference is smaller. Additionally nobody adds in the cost of the included software (iMovie, iDVD etc) or free developer tools, add the cost of purchasing tools of this grade for the PC and I don't think there would be much - if any - price advantage left. The event consisted mainly of people sitting around chatting and using their PCs. 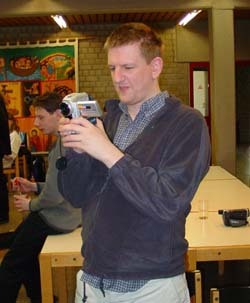 There were a few DVDs being played, cokes being drunk and even some coding - Marcus Overhagen was working on the OpenBeOS Media Kit. Many pictures and videos were taken, You'd wonder if it was a Sony user group with the number of cameras and Sony laptops around. There was even a "Future BeOS" meeting - several people had PalmsOS PDAs... Palms always appear at BeOS events and IIRC ex-Be Fearless leader JLG was in charge of the Apple Newton project and may have been involved with Palm at one point. For lunch we got the usua l- what else but pizza??? Then Bernd gave us a presentation on BeOS NG. There was very recently an announcement by YellowTab (the company that Bernd runs) that they had lost their financial backing and had to abandon the project. However, there was so much work put into BeOS NG that it's going to be finished off and sold for 49 Euros a pop. Bernd is also in discussion with the OpenBeOS and Blue OS guys. While the presentation was in German there was also a visual display on the beamer and we could see the installer and all what it can install. This is a very big collection as it not only includes BeOS personal edition but appears to also include pretty much all of Bebits! All neatly packaged in the installer at 49 Euros it'll be well worth it even without an OS. If you ever get bored there are dozens of emulators so you can play with other systems as well. That evening we had dinner in the shape of a "BeBeQue". Plenty of Sausages and stakes were cooked up on a "holy" BBQ (it belongs to a church and had a big hole in the bottom). It took quite a while to cook for everyone because of the sheer amount of food but it made a nice change from the usual where we go into town and have a meal (usually sitting outside and freezing!). That night some people went off to watch a movie on the beamer (it was better than everyone being crammed around a PC) while Peter grabbed the video I had of a previous BeGeistert (005 uncut!) and made it into a quicktime then DVD movie. This took a while as the tape is an hour long and after recording it we discovered the recording mode of my camera was incompatible with his camera. It proved popular as a few people wanted copies. Then someone put on a German cartoon and a crowd of us watched it, I've haven't the slightest idea what it was about but it was very funny. On Sunday I got up at something resembling a sensible time which is very unusual for me and I got a proper breakfast, The supplied German breakfast consists of bread, butter, slices of meat, cheese and coffee. For a British person this is highly weird but I'm guess used to it now. Mark Hellegers gave a demo of his FileDisk program which allows web based control of files on a BeOS system. You could do this with other systems but this allows you to access all of the attributes which BFS gives you. He couldn't really demo it properly as his presentation was given from a 32MB laptop which wont run Mozilla. It doesn't work properly with Net+ (not much does these days) but we could see the general idea as it could produce the displays. Previous BeGeisterts, especially a couple of years back were much bigger with many presentations going on and with new software applications being shown off. Since then the numbers have dropped off, having said that I don't think this one was much worse than 006 or 007 (license to code). One major difference was that there was none of the prevailing doom and gloom of before, There is no uncertainty any more as BeOS is now officially dead and the future is what we make of it. The second stage, OBSO is the so called "glass elevator", this is the next generation and there are ideas a plenty for it. One thing being worked on is media output over the web. This raises the question of what OBOS is going to be optimised for, general servers need to handle many users with many small files, you can get away with relatively high latency and real time is utterly unimportant. Media on the other had is the exact opposite, relatively few users, with a small number of big files with latency and real time being critical. You cannot optimised for both, it's a bit like the Heisenberg Uncertainty Principle (it applies to more then Physics) in that you can have one or the other. I hope OBOS does not fall to the temptation of building yet another server OS, or worse - the all things for all men approach of Windows and Linux. From what I was told they are going for a specific market so they'll likely do the right thing. Then it was time to pack up and go home, a crowd of us went for a pizza first, though they thought my choice of spinach, ham with chill sauce was a bit odd. It was good to see everyone again and I hope to be back next time. As ever Charlie and his team did a great job organising it all and it was much appreciated. BeGeistert 009 has been announced, see the BeGeistert site for more details.